Well, we never got to the ribs I was so hopeful about last week, but it was one of the most relaxing weekends in a long, long time. There was alot of great food, though, so not to worry. Later that day, with nothing really planned for dinner, I remembered reading a review in New Jersey Monthly for a Thai restaurant in Belleville. Since my husband, Barry, is always lobbying for us to visit non-Italian restaurants (not that he is anti-Italian food, in fact, he loves it, but there is a definite glut of Italian restaurants in NJ and Italian is always my go-to cuisine), I thought this was worth a visit. Topaz Thai is a small, family-run operation with "Mama," otherwise known as Wanida, at the helm. Wanida cooks for you like you were in her home; everything is fresh, plentiful, and cooked to order. When she learned that Barry had requested his food really spicy, and that he had been to Thailand many years ago, she came out to chat and to make sure he meant "really spicy." Wanida learned to cook at her mother's side in Thailand and this is the real deal. When I mentioned above that the food is fresh, I wasn't kidding: the fish of the day (Sea Bass) was caught that morning by Wanida's husband (a chef at the Pierre Hotel). It was delectable. We ordered it crispy and she suggested the chili sauce - definitely the right choice. We began the meal with two appetizers: Green Papaya Salad and Thai Spring Rolls. Both were wonderful. Looking forward to our next visit. Sunday, we grilled Seasoned Chicken Burgers (from our favorite Goffle Road Poultry Farm), enjoyed with fresh corn, and Stiner's Famous Potato Salad. When we picked up the corn at the roadside stand in Chestnut Ridge, NY (just over the NJ border), the farmer had baskets of gorgeous apricots that I couldn't resist. I knew I had white nectarines waiting at home, now all I needed was a recipe. In my trusty recipe vault I found "Summer Fruit Crisp," a recipe (see below) that allows for many variations of fruit fillings. This was the perfect recipe for late summer stone fruits, and the crisp topping of butter, chopped walnuts, brown sugar was de-lish! I love the fact that you can use just about whatever fruit you have at home or can find at the local market -- the fig and cherry from the list below sounds divine. Today, the last day of the long labor-less weekend, we are grilling chicken thighs in one of Barry's marinade concoctions that are always good, more corn (because at the end of the summer, you just can't get enough), potato salad redux, and probably another small helping of fruit crisp. Truly, a delightful way to cap the weekend. I hope good friends, great food, and a little R&R found their way to your home this holiday weekend. 8 Servings - serve with a dollop of whipped cream or a splash of good and thick heavy cream (good vanilla ice cream would also do nicely). Preheat oven to 375 degrees. Have ready a deep 12-inch ovenproof baking dish. For the topping: in medium bowl, thoroughly combine the flour, sugars, and salt. Scatter over the pieces of butter, and using a pastry blender (or two round-bladed knives), cut the butter into the flour mixture until it resembles small flakes. Add the almonds of walnuts and the vanilla. Using your fingertips, work the mixture to form big and small cohesive lumps of topping. The pieces will be moist, buttery, and irregularly shaped. Set aside. For the fruit: in a medium bowl, gently combine the fruit or berries, preserves, and sugar. Turn the fruit mixture into the baking dish. Strew the topping over it to form an even layer, but keep the crisp light rather than packing it down. Bake at 375 for 40-45 minutes, or until the topping is set and golden and the fruit is bubbly. Sprinkle the top with confectioners' sugar, if desired. Serve warm. Note: the crisp may be made into individual servings. Divide the fruit mixture among eight 1-cup ovenproof baking dishes and sprinkle on the topping. Place the dishes on a rimmed baking sheet and bake in a preheated oven at 375 for 35-40 minutes, until the fruit is bubbly and topping is golden. Just before serving, dust tops with confectioners' sugar, if desired. Variations: a combination of sliced fruit and berries creates a flavorful base. Peach (or nectarine) and Blueberry: use 3 C thickly sliced peaches (or nectarines) and 2 C blueberries. Peach, Plum, and Blueberry: use 2 C thickly sliced peaches, 2 C thickly sliced red plums, and 1 C blueberries. Apricot and Cherry: use 3 C (halved, pitted, quartered) apricots and 2 C (stemmed and pitted) sweet cherries. 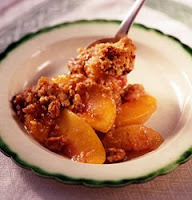 Apricot and Peach: use 3 C (halved, pitted, quartered) apricots and 2 C thickly sliced (peeled) peaches). Apricot and Blueberry: use 3 C (halved, pitted, quartered) apricots and 2 C blueberries. Nectarine and Cherry: use 3 C thickly sliced nectarines and 2 C (stemmed and pitted) sweet cherries. Plum and Cherry: use 4 C thickly sliced plums and 1 C (stemmed and pitted) sweet cherries. Fig and Cherry: use 2 C (stemmed and quartered) figs and 3 C (stemmed and pitted) sweet cherries.